Set up a real time voice altering system in the Blackfin, with at least one effect. The students must provide a live demo. For ECG, electrocardiogram, electrical signals are normally picked up by electrodes attached to the skin on the chest, good electrical contact is essential as the signals are small. The power of DSP for real-time filtering and conditioning means that a good signal can be obtained using simple hand held sensors. Design and build an ECG system using simple hand held electrodes capable of displaying the full detail of the ECG waveform. Signal processing should be done by the Blackfin; the graphical display may be from the Blackfin or on a PC. Make a real-time "performance system" based on detection of the movements of a solo performer (air guitar, air drums, dance, or other physical body movements). Music or sound synthesis must be triggered and modified by detecting the movement of the "performer", a graphical display may be generated to enhance the effect. You can extend its capabilities in any way you like; your solution may be heavily dependant on hardware or may be mostly software. It may involve PCs but the DSP must be carried out by the Blackfin and be (mostly) real-time. A final requirement is that RFID must be used somewhere in a meaningful way in Part 2 or Part 3 of the project. Although many of the competing teams had not yet studied DSP as part of their coursework, all the teams learned to use the BlackFin processor and the Visual DSP environment very quickly. The ADSP EZ-Kit Lite proved very popular with the participating teams, and even comparative novices were able to use it to get to grips with Digital Signal Processing concepts and applications. The extensive back-up material also proved very popular. 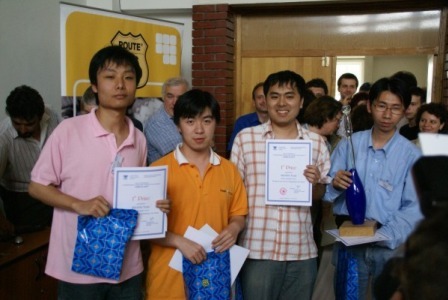 Given that the teams had such a short time in which to achieve their tasks, the results produced by the project teams were extremely impressive. Most of the teams achieved the project goals and produced functioning and useable ECG monitors as well as impressive musical instruments. The competing groups displayed a great deal of ingenuity in devising various means of sensing movement by the 'musician' and using this to generate sounds from the EZ-Kit. Some groups chose to use accelerometers in two or three dimensions, while others elected to use various types of image processing to detect movement by the 'musician'. The winning team produced an extraordinarily accomplished project in the short time available. In addition to arresting voice effects and a sophisticated ECG monitoring system, complete with excellent graphics, RFID user identification, medical database and web-based access, the team also produced a fully functional musical instrument. The winning instrument used accelerometers for 3-D movement detection, which allowed musical notes to be generated. All the movement detection and music generation were accomplished using the ADSP BF533 EZ-Kit Lite. The Beijing team also produced a PC-based display that allowed the user to see the movements he or she had made to facilitate learning to play the instrument, as well as an overall microcontroller based system manager which controlled the operation of the entire system, which, naturally used wireless links to free the user from attached wires. 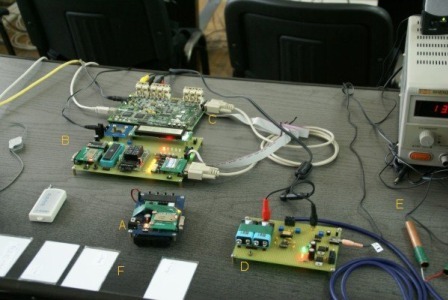 The photograph below shows the handheld instrument (A), the system controller (B) and the EZ-Kit Lite(C), which formed the musical instrument, produced by the winning Beijing team, as well as the ECG interface (D), hand-help ECG sensors (E) and RFID cards (F). The Analog Devices ADSP BF533 EZ-Kit Lite was extremely popular with all the participating teams and the extensive range of support materials and sample code available from Analog Devices made the learning curve associated with using new tools and techniques very short indeed. 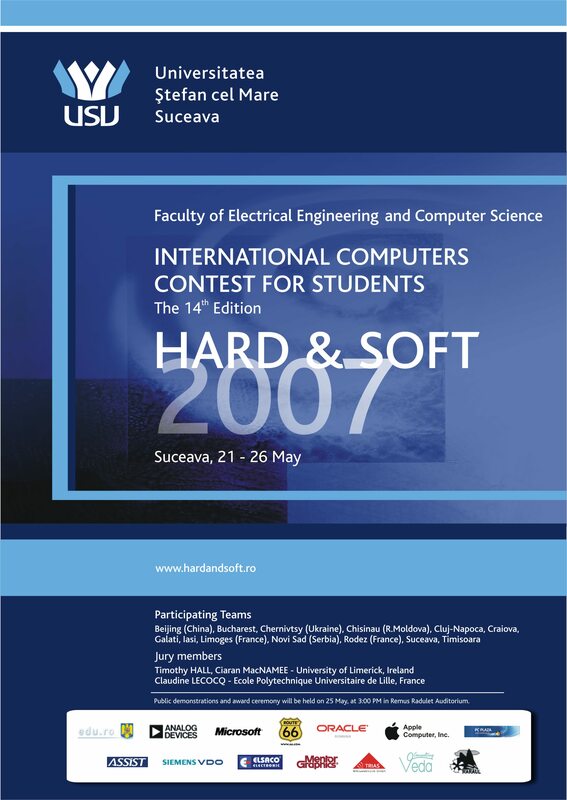 As a bonus prize, the top three teams were allowed to keep a BF533 EZ-Kit Lite for use in their home universities, but the majority of the kits were retained in the host university, the "Stefan cel Mare" University of Suceava, where they will be used to develop lab-based Digital Signal Processing" course in the Faculty of Electrical Engineering and Computer Science.